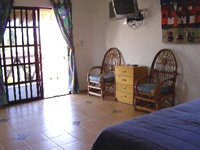 Holbox vacation rentals in Holbox - Amigo's vacation rentals in Holbox: Rental house on Isla Holbox with 2 bedrooms, 3 bathrooms. 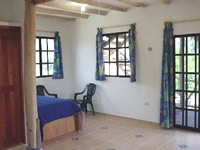 Two bedroom three bath home on Isla Holbox. 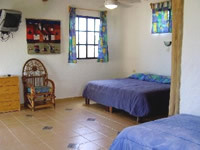 Each bedroom has private bath, A/C,ceiling fans, remote control TV and bedding options of either king plus two singles or four single beds. Separate living-kitchen building has full bath and all cooking/eating utensils, TV, VCR, DVD and stereo system to make your stay enjoyable. Families and groups welcome. 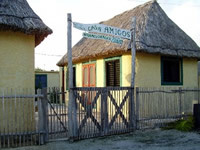 Just few blocks from the ocean on quiet sand street in this remote part of Quintana Roo Mexico.Ideal for a true R&R vacation holiday.. The roof top viewing area gives you a 360° view of the area..
Price includes all taxes up to 8 people. Quiet remote sandbar island 2.5 hours west of Cancun in the water basin where the Caribbean meets the Golf, the island is all sand streets and really laid back tropical atmosphere. No cars, just golf carts to get around. 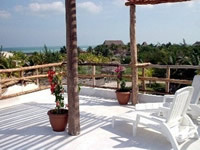 The place for a true R&R vacation.No wild places or large crowds..
Isla Holbox is a fisherman's paradise. Flyfishing, bottom fishing and at certain times of the year sport fishing are available from Isla Holbox.. Kite surfers enjoy the winds for their sport.. Every mid June to early September the huge fish, The spotted Whale Shark comes to visit the waters near Isla Holbox. You can snorkel with these large animals as trips are available from Holbox. On the main land the impressive Mayan ruins are a short drive away.